WHEN SEIFERT IVERSON SAW A LOAD OF HEREFORD CATTLE BEING trucked out from the Sixes river, he knew something wasn't right. He called the brand inspector who called the state police. They called E.S. Dement, a veteran rancher with extensive pastures far up the Sixes river. E.S. and the police went looking and soon thereafter an amazing tale of duplicity, deceit, and deception started to unfold. Here, in an account E.S. Dement wrote in 1939, is the story of how Myrtle "Ma Jett" Garner, the lady cattle rustler who tried to sneak E.S. 's cows away from under his nose, was brought in to face her justice. 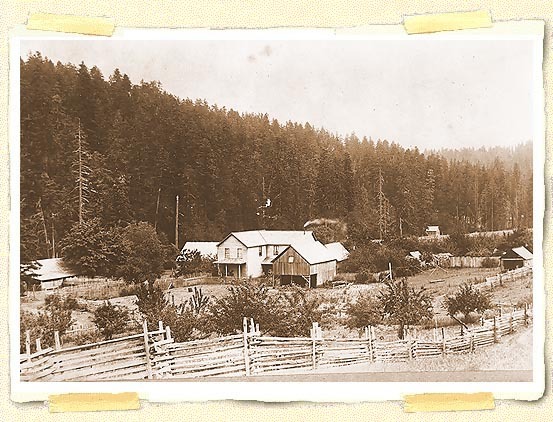 LEFT: The town of Eckley thrived in the late 1800s and early 1900s. Today, the Haines house and hotel are the headquarters of the Dement ranch. 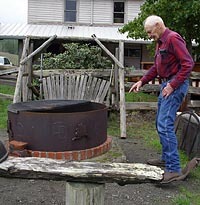 ABOVE: Sam Dement tells the stories behind the brands of the Dement Ranch. BELOW: The Dement ranch today.